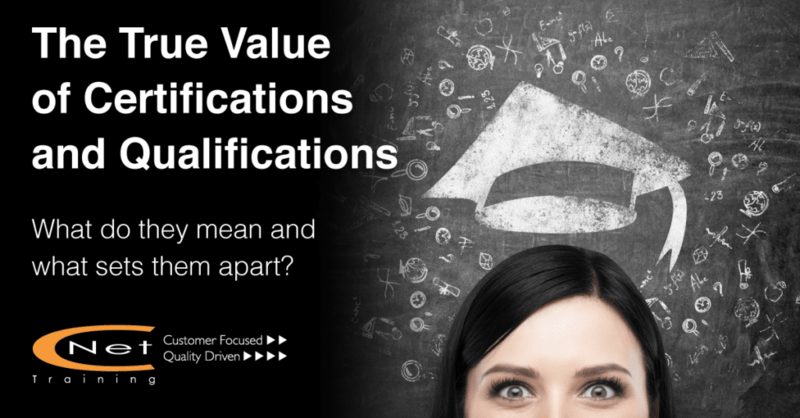 Certifications and qualifications … attract a certain level of kudos, yet what do they mean and what sets them apart? Certifications prove that an individual has completed the learning process and achieved the stated objectives. Meaning that the strength of a professional certification is based on a fundamental trust that the individual who receives a credential (the certification) has proven he or she possesses the required experience, knowledge or skills of a profession or practice. This credibility is paramount for the credential to maintain value for individual stakeholders, the profession and the public. Developing a reputable certification program requires expertise in several areas. Whether the program sponsor is a private or public entity, in-depth knowledge of the industry and job tasks, educational requirements and eligibility requirements, assessments and maintenance are a few aspects that must be included in the program development plan. Certifications can provide a post nominal title and the use of official certification material such as a brand logo to help prove your certification. Certifications are unique; they show a commitment to life-long learning as re-certification is usually required approximately three years after each new certification. Built on Demonstrated Market Need: There must be perceived value in distinguishing those who have proven competency and those who have not. Objectivity: Certified and independent subject matter experts, third-party endorsement and autonomy in governing the certification program are essential in developing and maintaining a valid and legally defensible credential. Rigor: A certification that requires little effort or knowledge or one that everyone can earn is typically of lower value than one that demands great effort, determination, experience, knowledge and skill. A rigorous regimen of training and assessment is essential to a successful certification program, which by its nature is often perceived as a competitive advantage. Emphasis on Ethics: Ethical conduct covers a broad range of topics, from protecting the certification assessment from cheaters to ensuring the ethical practice of the profession. Re-Certification: As all industries and organizations grow and change, professionals that serve them must do the same. One way to determine the value of certifications is to check if the education provider has a re-certification process in place. This shows that they also have a commitment to ensuring skills remain current and reflect the very latest changes in your chosen sector. Plus, the re-certification process should be quick easy and cost effective. Qualifications are valid for life, they do not need renewing. Qualifications differ from certifications in that they are controlled by international educational bodies and only approved centers can offer qualifications. The process to become an approved Centre is a rigorous one and re-assessment is required to maintain approved center status every 12 months. CNet Training is an approved center and have been for over twenty years. Individuals who have been awarded qualifications can therefore have the added confidence that they have received high quality education from a respected and trusted organization. An organization that has strict processes in place for quality of delivery and who themselves are assessed to ensure they continue to deliver the right high-quality educational content that continues to meet the set learning objectives set for each program. This highlights the fact that only the best education companies can gain this approved center status. There are different qualification levels and each level can be referenced across the world. Center Management Systems: Demonstrate robust systems are in place to monitor and evaluate the effectiveness of all qualification delivery and assessment staff. Policies and Procedures: Ensuring clear policies and procedures are in place to internally verify all aspects of the learning and assessment of it. Internal Verification: Verification of assignment documentation is thorough, planned, recorded and used to enhance future practice. Verification records are accurate and available for audit as needed. Many training organizations provide self-certificated training i.e. award attendance certificates with no awarding organization or academic processes, rigor or assessment. Whilst they are entitled to do that it should not be confused with the higher and vocational education programs provided by professional training and education providers such as CNet Training, which lead to the award of a bona-fide qualification by a true, authorized awarding organization (Pearson – who is the world’s largest education company). To discuss the best technical education programs for you and your teams across the data center and network infrastructure sectors, please contact CNet Training at info@cnet-training.com or visit www.cnet-training.com. About CNet Training: International award-winning technical education company, CNet Training has been designing and delivering professional network infrastructure education and training programs since 1996. Today CNet is the global leader in technical education for the digital infrastructure industry, comprising the data center and network infrastructure sectors, and is the only industry dedicated education provider in the world to award both internationally recognized qualifications and professional certifications. These qualifications start at level three and culminate in the world’s only level seven Masters Degree program in Data Center Leadership and Management. A significant part of CNet’s history is the development of the highly acclaimed Global Digital Infrastructure Education Framework, which offers industry professionals an opportunity to plan technical education, qualifications and certifications to meet on-going individual and business needs. CNet delivers classroom-based technical education programs led by expert Instructors, in locations across the world and via remote attendance, introducing real-time collaboration with a virtual training room, allowing ease of access to all industry professionals wherever they are in the world. In addition, they also deliver distance learning programs. Alongside its impressive client list of multinational organizations, the company is proud of its close associations with the world’s leading trade associations and industry bodies including the Infrastructure Masons, AFCOM, 7×24, BroadGroup, Green Grid and Pearson. CNet is also trusted by many of the world’s leading manufacturers of data center and network infrastructure solutions to design and deliver their specific training and education programs.